Two of Europe’s most respected defence companies, Rheinmetall and Steyr Mannlicher, have joined forces to manufacture and market the RS556 modular assault rifle. This German-Austrian cooperation project adds a key item to Rheinmetall’s growing array of infantry products. Rheinmetall and Steyr Mannlicher are offering the RS556 assault rifle as a jointly produced product, made in Germany, with a German valued added share of 60%. Among other things, the two partners thus have their sights set on the German market. 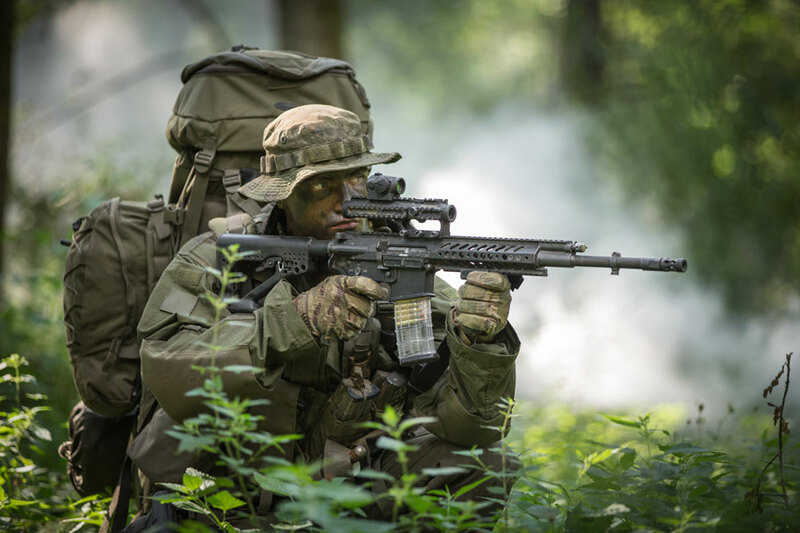 This innovative weapon is a possible candidate for the new “System Sturmgewehr Bundeswehr”: the German armed forces intend to replace their standard G36 assault rifle with a more advanced system starting in 2019. With a 16” barrel (406 mm) and a fully loaded, 30-round magazine, the RS556 weighs around 4.2 kilograms, just over 9 pounds. The adjustable-length light-weight stock clicks into seven different positions, meaning that operators can adjust the RS556 to match their individual equipment profile in optimum fashion. In a matter of seconds and without tools, the hammer-forged barrel can be easily exchanged. This means that the RS556 can be readily modified for various missions. A number of standard barrel lengths are available (14.5”, 16”, 18” and 20”); however, customer-specific barrel and rifling lengths can be easily created. The RS556 features several standard and optional NATO accessory rails with receiver systems designed in accordance with MIL-STD-1913, STANAG 2324 and STANAG 4694. This means that the weapon can be fitted with various optics and night observation devices or laser light modules. A 40mm grenade launcher can also be mounted on the new assault rifle. Moreover, the RS556 is compatible with Rheinmetall’s modular “Future Soldier – Expanded System” (IdZ-ES), and can also be connected to other soldier systems. Founded in 1889, the Rheinmetall Group is a tech enterprise specializing in mobility and security. Consisting of three divisions – Vehicle Systems, Electronic Solutions and Weapon and Ammunition – the Group’s Defence arm is one of the world’s foremost defence technology makers, supplying a wide array of advanced military equipment: from vehicle, protection and weapon systems to infantry equipment and air defence solutions to networked target engagement sequences and electro-optics and simulation technology. In the small arms domain, Rheinmetall has produced such renowned products as the G3 assault rifle and the MG3 machine gun. Werndl-Holub breechloading rifle, the Mannlicher straight-pull bolt-action rifle with en bloc clip, and the SSG69 sniper rifle. The Steyr AUG bullpup system is used by at least 37 nations worldwide. As the standard rifle of military organizations ranging from the Austrian Army to the Australian Forces, it has proven extremely effective in all climate zones. In addition, Steyr Mannlicher supplies modern sniper rifles such as the SSG08, the SSG Carbon and the .50 cal. BMG HS50M1. Likewise meriting special mention is the company’s GL40 40mm grenade launcher, which can be used in build-on or standalone mode.